Mini variants of popular high end smartphones is in line of the current smartphone trends, but LG has decided to go the other way round with its LG G Pro Lite Dual SIM (Quick Review) smartphone priced at Rs. 22,990. The Display size remains similar to LG Optimus G Pro (Full Review) at 5.5 inches but the rest of the specs have been trimmed down to cut the cost. This 5.5 inch display now sports 960 X 540 pixel qHD resolution which gives you pixel density of 200 ppi which is not very impressive on this size display. The phone is 9.4 mm thick and comes with a Stylus to take full advantage of the large display. The processor has been downgraded to 1 GHz Dual core processor which is assisted by 1 GB RAM. LG has not specified the manufacturing company for this processor. The internal storage is 8 GB which is pretty good. You can further extend it to 32 GB using MicroSD card. The primary camera is of 8 MP and has LED flash support for low light photography. The camera is capable of full HD recording at 30fps. The secondary camera of 1.3 MP is also present for video calling. The camera features are not very impressive at this price range. 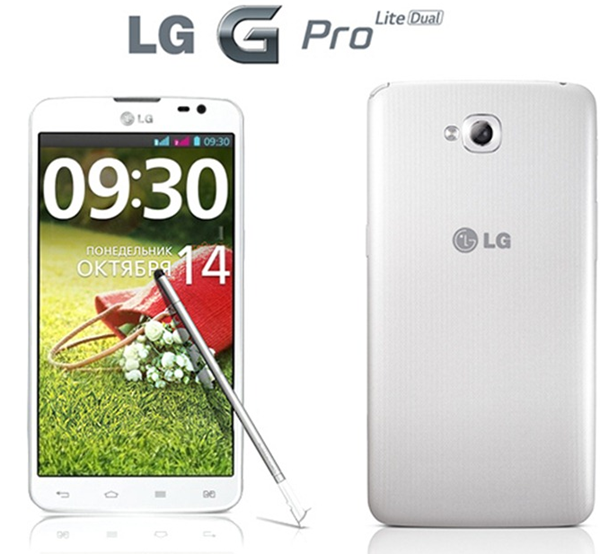 The battery capacity is 3140 mAh which is same as LG Optimus G Pro and will give you sufficient screen time and talk time. The battery will give you around 14 hours of talk time and 845 hours of standby time. The phone sports Dual Audio Speakers which lets you enjoy your Multimedia content. Features like KnockON, Pause and Resume Recording, QSlide, QuickMemo and QTranslator, which were much hyped in LG G2 are also preloaded on this phone. This phone will compete against phablets like Micromax Doodle 2 and Samsung Galaxy Grand Duos. The phone is priced at MRP of 22,990 but you can get it at Rs. 18,300 on Snapdeal.